Arkansas Manager Gaylen Pitts tried to explain Arkansas' loss this night in August 1989 and the explanation included an off night for starter Brian Stone, according to The Tulsa World. Stone walked six in the game before getting pulled in the seventh after the final free pass, The World wrote. "Our trouble was we didn't have any two-out hits tonight," Pitts told The World afterward. "Besides that, Stone walked too many and ran out of gas in the seventh." Stone went 3-2 over nine starts for Arkansas that year, playing the rest of the year at single-A Savannah. 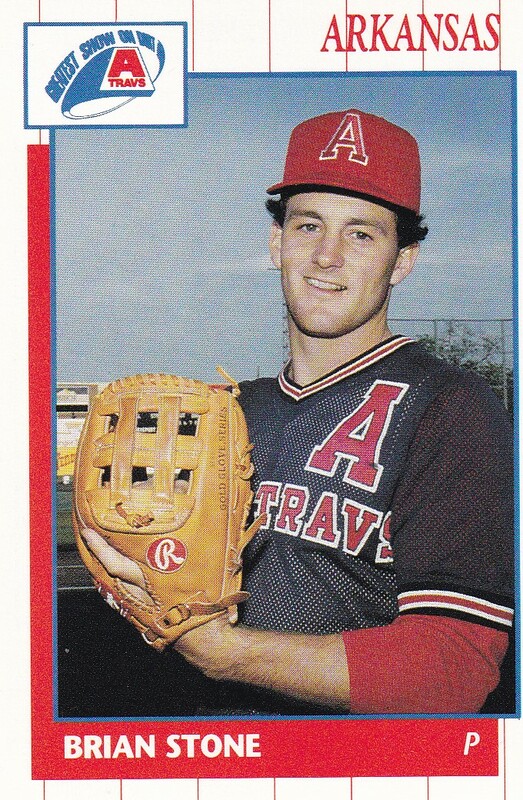 He went on to return to AA Arkansas in 1990, and briefly make AAA Louisville. But, over his six-season pro career, Stone never made the majors. Stone's pro career began in 1986, taken by the Brewers in the fifth round of the draft out of the University of New Haven. At New Haven, Stone went 23-6 over three seasons at the school. He had a 3.43 ERA and struck out 233. In 2010, he made the school's Hall of Fame. Stone started with the Brewers at rookie Helena. He went 6-2 over 14 starts, with a 4.99 ERA. He moved to single-A Beloit for 1987 and went 11-7, with a 4.97 ERA in 29 outings, 25 starts. He made single-A Stockton for 198, then moved to the Cardinals system and Arkansas and Savannah for 1989. He went 9-5 overall that year, with a 3.68 ERA. He picked up his first win for Arkansas in a late-July 4-1 victory. For 1990, he saw both Arkansas and Louisville, but got into only 10 contests between them. He returned to Arkansas for two starts in 1991 to end his career. Stone has since returned to Connecticut and has served as a youth instructor. In 2019, he is listed as a pitching instructor for the New England Hardball Academy in Fairfield.